This model has been curated and unit-checked by Penny Noble of Oxford University and is known to run in PCEnv and COR and reproduce the results published in the paper it is based on. During the years that followed the formulation of the McAllister-Noble-Tsien Purkinje fibre model in 1975 and the Beeler-Reuter mammalian ventricular model in 1977, many experiments were performed which provided a greater insight into the working of the ion channels in cardiac tissue. D. Di Francesco and D. Noble (1985) constructed a new model of cardiac electrical activity which sought to incorporate much of this new data (see the figure below). 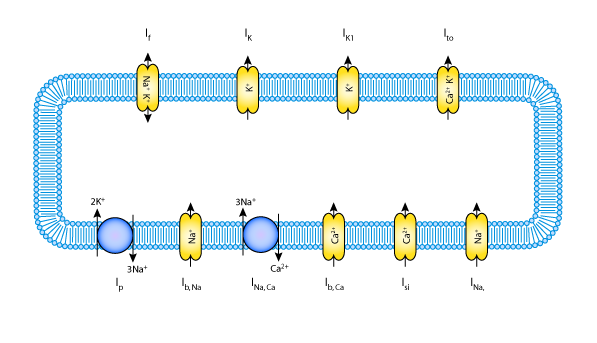 A schematic diagram describing the current flows across the cell membrane that are captured in the DFN model. The network defined in the CellML description of the Di Francesco-Noble model. A key describing the significance of the shapes of the components and the colours of the connections between them is in the notation guide. For simplicity, not all the variables are shown. The membrane physically contains the currents, exchangers and pumps, as indicated by the blue arrows in . The currents act independently and are not connected to each other. Several of the channels encapsulate and contain further components which represent activation and inactivation gates. The addition of an encapsulation relationship informs modellers and processing software that the gates are important parts of the current model. It also prevents any other components that aren't also encapsulated by the parent component from connecting to its gates, effectively hiding them from the rest of the model. Derived from workspace Difrancesco, Noble, 1985 at changeset 358c42ad2d26.